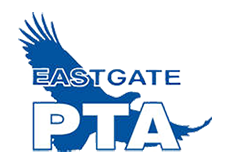 Eastgate Elementary PTA does much of its work through our amazing base of volunteers working tirelessly to provide the best possible programs. We are extremely thankful for those who continuously give their time. We believe the work we do is vital to the health of our school and the education of our children. We are always exploring ways to engage our volunteers. We'd love to hear your ideas! Email the board at contactus@eastgatepta.org. ALL volunteers (classroom, parent & VIBES volunteers alike) fill out the same BSD (VIBES) Volunteer Application. If you are interested in volunteering in the classroom, for one of our PTA programs, or simply donate an hour or two here and there you will need to have filled out and submitted the VIBES paperwork. If you have not filled out a VIBES form with in the last five years, please take the time and turn it into the office or mail it to the address below. Please take a moment an review, sign and return Eastgate's Parenting Training Volunteer form to the office. We welcome ALL volunteers including stay at home parents, working parents, extended family, grandparents and community members. OR you can drop it off in the office. Please allow at least 2 weeks for general processing; up to 4 during peak times. You will receive notice from the district if you HAVE NOT passed the background check or if BSD needed more information. Sign-up on the Eastgate Volunteer Email List!